Franklin County Schools, headquartered in Louisburg, North Carolina, has 14 K-12 schools and is experiencing steady growth in student population. Committed to creating a 21st century learning environment, Franklin County administrators recently sought a solution for upgrading their classroom audio/video technology. They chose to install Extron PoleVault Classroom AV Systems and deploy GlobalViewer Enterprise software to streamline system management and support. Franklin County Schools had a collection of legacy classroom AV technology, using a temporary cart system that was difficult to support and inconvenient for teachers. Carts loaded with a projector and AV sources took up valuable floor space and the cords created a potential trip hazard in the classroom. A lost or broken handheld remote was an annoyingly common occurrence. Because there was very little consistency in the products used from room to room, training teachers to use the equipment was difficult. Providing technical support required an inordinate amount of time and effort, since each room was configured differently. “We had only a single individual to manage the county’s entire technology layout,” says Chris Shearer, Chief Technology Officer for Franklin County Schools. 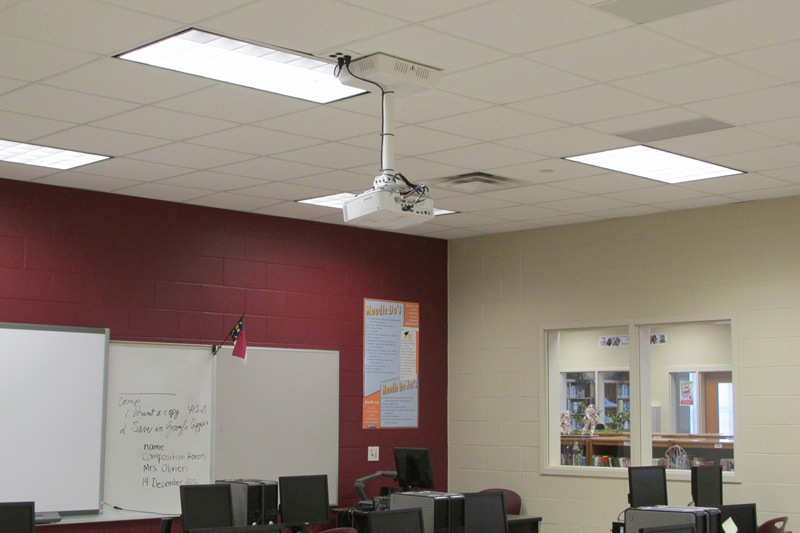 “It was a struggle to support the wide variety of products while trying to ensure that every teacher was proficient with the classroom technology.” Shearer identified the need for a standardized AV system that would help him serve his teachers more effectively while streamlining his support and maintenance efforts. 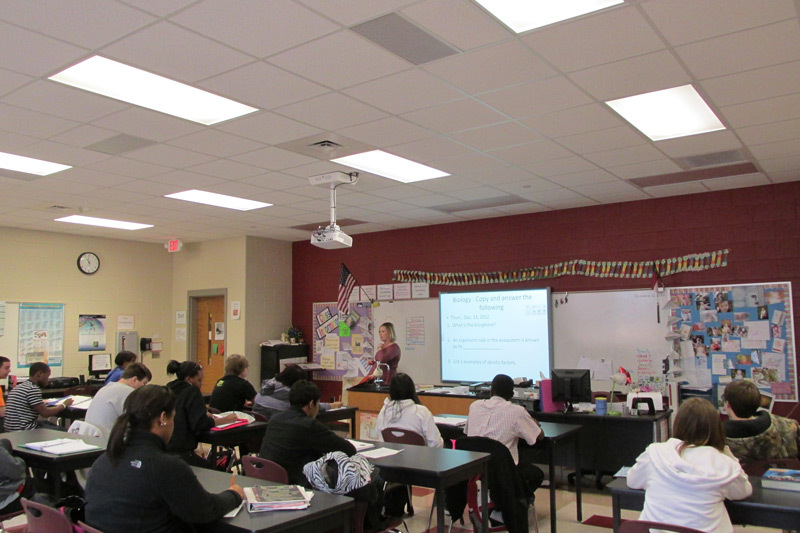 Shearer learned about the Extron Classroom Technology Grant Program and completed the 10-minute online application. “The grant process was quick and easy,” says Shearer. “Extron gave Franklin County an opportunity to experience a classroom AV system absolutely free, with no strings attached.” Using a new elementary school as the model to create the ideal classroom environment, Extron worked with Franklin County to configure a network-enabled classroom AV system that could be duplicated in every classroom. The model classroom was a success and soon efforts to duplicate the room were launched. After testing a variety of AV products, the county elected to equip each room with a computer, projector, interactive white board, and document camera. AV equipment is mounted securely near the projector, and the wall-mounted MediaLink controller gives teachers centralized control of display power, source selection, and volume. Today, Franklin County Schools has more than 300 Extron PoleVault Systems installed and connected to the network. Each classroom system is nearly identical. This uniformity has made it easy to train teachers in how to use the technology. Having fixed system installations in every classroom has allowed the schools to reclaim valuable floor space that was previously taken up by carts of equipment. Cables are no longer stretched across the floor, so the trip hazards have been eliminated, as well. Using Extron GlobalViewer Enterprise software, enables Shearer to support every classroom from a central location over the network. “The software’s Help Desk view lets us monitor a vast amount of data about our classrooms on a single screen,“ says Shearer. “Downtime due to a projector not working has been virtually eliminated because we can troubleshoot and resolve problems quickly, usually without making a trip to the classroom." 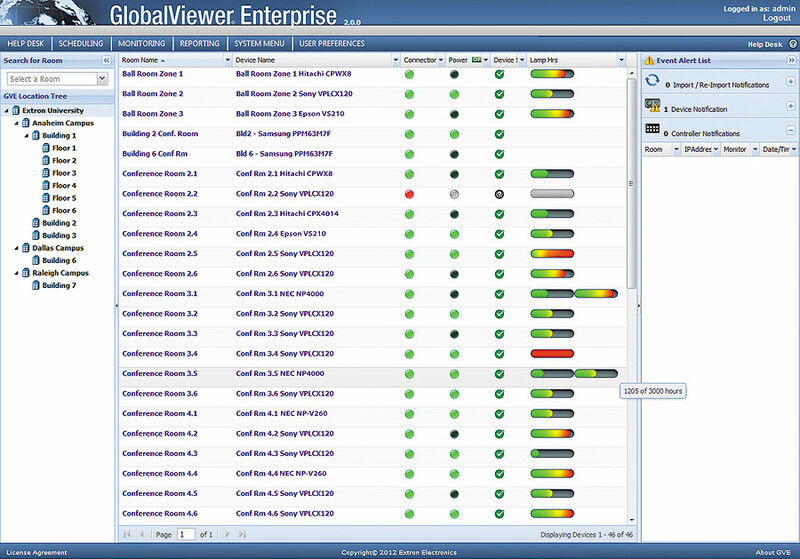 The county has found GlobalViewer Enterprise software to be a powerful resource management tool. Access to detailed room data is available with just a click of a mouse. “We use the software to track and record system usage data and create reports for administrators,” says Shearer.“ This helps with identifying needs for additional professional development and also aids with budget and planning for future purchases. Lower operating costs are another benefit of the Extron hardware and software. The classroom systems have built in Auto Power Save and Standby modes which reduce energy usage when the systems are idle. In addition, the scheduling option extends lamp life and further reduces energy costs by ensuring the displays and AV sources are shut down overnight, over the weekend, and during breaks. The teacher has access to the AV system without cluttering up the room with an AV cart.